OSWEGO, NY – With a perfect weather forecast on tap for the weekend, Oswego Speedway’s Shea Concrete ‘Steel Palace’ ISMA Super Series will finally open for racing this Saturday presented by North Country Home Builders. Saturday’s action will mark the first event of the 2014 season for the mighty ISMA Supermodifieds as well as round four of the Pathfinder Bank Small Block Super Road to the Championship. 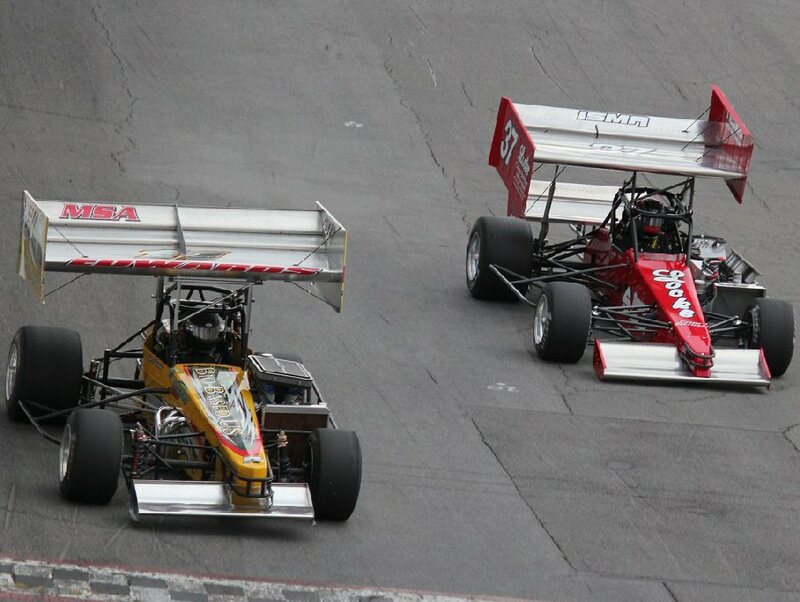 Kyle Edwards and Jeff Locke stream down Oswego Speedway’s front stretch with their ISMA Supermodifieds on May 3. The cars and stars of the ISMA Supermodified Series first came to Oswego back on May 3, but cold and wet weather all weekend forced the cancellation of the event. ISMA will be back and ready for action Saturday with a 50-lap main event on tap to kick off their season. Grandstand gates will open at 3 p.m. on June 7 with time trials set to start at 5 p.m. followed by heat racing at 6:30 p.m.
A rain date for Saturday’s event has been posted for Sunday, although the weekend forecast looks outstanding for Friday-Saturday-Sunday. Saturday’s ISMA Supermodified event at Oswego Speedway will now mark the first of three Shea Concrete ‘Steel Palace’ ISMA Super Series events at the Speedway. A year-long Oswego Super Series champion will be determined with events running on June 7, July 12, and August 30. On May 3 Oswego Speedway announced the introduction of the 2014 Speed Challenge, putting up $1,000 for the fastest lap of the season at the Speedway in Novelis Supermodified and ISMA Supermodified competition. Currently Bob Bond holds the Novelis Supermodified track record and bonus cash with a lap of 16.098 seconds set back on May 10. This Saturday will mark the first opportunity for ISMA Supermodified competitors to lay claim to their $1,000 prize and attempt to knock off the overall Speedway track record of 14.972 seconds held by Dave Shullick Jr.
Shullick has been hot in Supermodified action this season. So far in 2014, ‘Shoe 2’ has won both of the Midwest Supermodified Association events at Sandusky Speedway and also took third in the Jim Shampine Memorial Novelis Supermodified event at Oswego Speedway back on May 24. Initially, plans were in place for Shullick to bring each of his Jim Bodnar built Supermodifieds to Oswego this weekend, one to be piloted by his Nicotra Racing teammate Otto Sitterly. 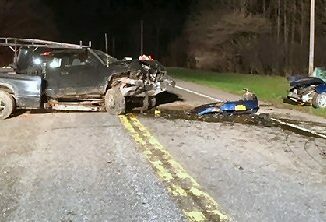 Unfortunately, a blown engine in the No. 95 at Sandusky last weekend will leave the machine, known as ‘Ice’ on the sidelines Saturday. Shullick will be joined Saturday night by his main Speedway rival Mike Lichty, the defending Shea Concrete ‘Steel Palace’ ISMA Super Series champion, as well as Lou Cicconi, Chris Perley, Ben Seitz, Mark Sammut, Jon McKennedy, Alison Cumens, Moe Lilje, Tim Ice, Jeff Locke, Eddie Witkum Jr., Rob Summers, and more. Locke will be looking to make it back-to-back victories at Oswego for the Locke Crane Services No. 37 team. Randy Ritskes took the team’s non-wing machine to victory at Oswego on May 31 in the Novelis Supermodified Spring Championship at the Speedway. A full field of ISMA Supermodifieds was on hand for the rained out show back on May 3 with a couple more local drivers expected this weekend. Both Tony Steiner and Keith Gilliam were not in the pit area on May 3, but are expected to be on hand this Saturday. Expect Oswego competitors Brandon Bellinger, Lou LeVea Sr., and Lou LeVea Jr. to each be in action as well. 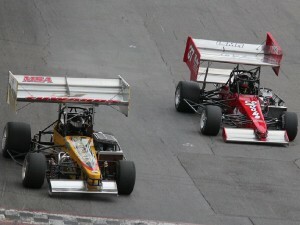 All ISMA Supermodified drivers in action Saturday will be focused on running up front through the first portion of their yearly schedule, with the top two drivers in ISMA points as of July 1 guaranteed to start the Budweiser International Classic 200 for Novelis Supermodifieds on Sunday, August 31.